Nearly three years ago, Danielle Losh plummeted to her lowest point. Her marriage ran its course. She lived in Wisconsin, her former husband’s home state, at the time. She had nowhere else to go but back home – more than 1,000 miles south to North Carolina. All she had to her name was $100, a Kia Sorrento, two dogs and her son, Liam, who was 2 years old at the time. It was November 2015. “I didn’t have a job lined up, and I didn’t know what I was going to do,” Losh said. Before the marriage, Losh was in school. She attended the University of North Carolina at Charlotte. She decided to be a stay at home mom after Liam was born. A life short-lived for Losh. She knew what returning home meant for not just her, but Liam, a little boy with a warm smile and now an owner of a sharp pair of blue-colored glasses – one of his best features. 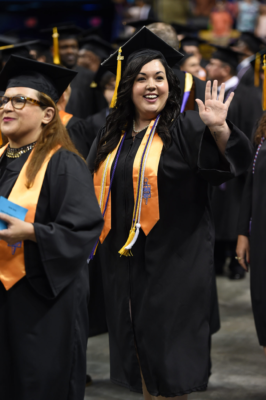 Not only was school the right choice for Losh, so was returning to her family. Her father, Brad Losh, met his youngest child and grandson in West Virginia. He filled Losh’s gas tank and bought them food for the second leg of the trip. Brad Losh was secure in his daughter’s decision. The pair along with Judith Anne Losh renovated a home she owned in Lumberton. Judith Losh is Losh’s mom. It was Losh’s childhood home and now would become a “home” for her and Liam. Judith Losh didn’t hesitate to help her daughter with daycare and living expenses. Those values instilled in Judith Losh came from her parents. Then, the time came for Losh to do her part. She began working as a secretary for a small county facility in Robeson County. Enrolling in college again was the next step. 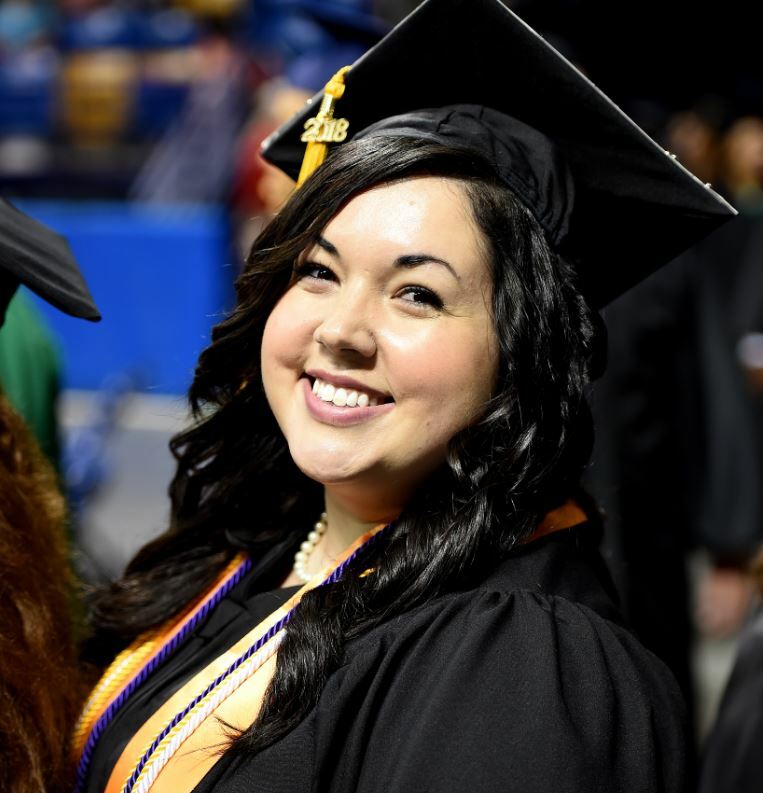 She chose Fayetteville Technical Community College, an easy choice for a few reasons. She enrolled in a mostly online program, healthcare management technology. 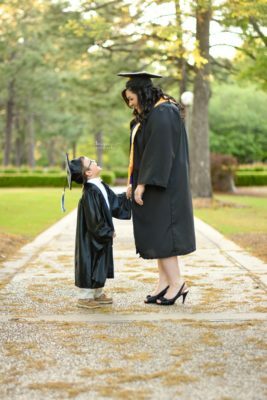 Online courses eased juggling a full-time job and being a single parent. In addition, Brad Losh has worked at FTCC as a media specialist for nearly 30 years; he has been a professional photographer for 38 years. As Losh fulfilled her end of the bargain, so did her family. Judith Losh said her daughter rarely asked anyone to watch Liam. However, mother and father knew they had to offer help. Liam would stay with his granddad while Losh went to campus for an hours-long science lab one semester. On weekends, Liam would stay with his grandma. Some days, when Liam knew mom had to concentrate, he would quietly cozy up next to her with his iPad or a book. Help from her parents, and close friends, was something Losh appreciated. 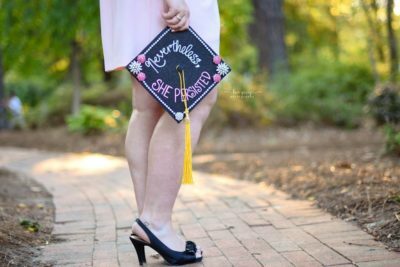 Sometimes, she wasn’t sure if graduating was possible when homework assignments turned tedious or studying for exams became overwhelming, coupled with motherhood and working. It was graduation day. 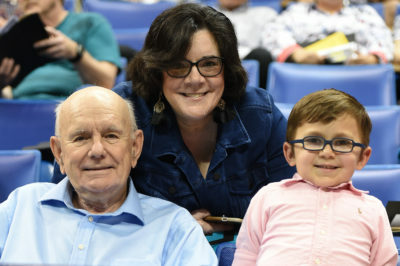 Her mother, Liam, Grandfather Joseph Lakawicz and close friends waited in the crowd to see Losh walk the stage as one of 2,498 curriculum graduates. 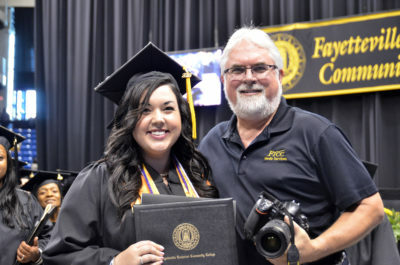 Brad Losh, with a Nikon camera in hand, waited at the stage’s end to capture a picture of his daughter accepting her degree. After Brad Losh snapped the picture of his daughter, he hugged her. Her family, a few feet behind them, cheered as Liam shouted, ‘Yay, Mommy! You did it!” Judith Losh said Liam was “her voice” in that moment. 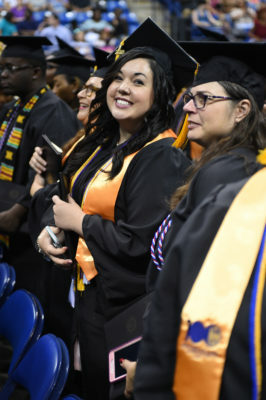 Roughly, two weeks after graduation, Losh received a job offer to work as an optometric technician for an eye doctor’s office in Robeson County. Losh said the job offer so soon after graduation was unexpected. She also plans to pursue her bachelor’s degree in the coming year. Judith Losh hopes there’s a lesson others can take away from her daughter’s journey so far. Learn more about the healthcare management technology program.